Yes, I/We will be pleased to attend on June 18! Please note that $200 per attendee is the non-tax-deductible portion of your contribution. Reserve tickets now We thank you for your generosity and look forward to seeing you at the dinner on June 18! 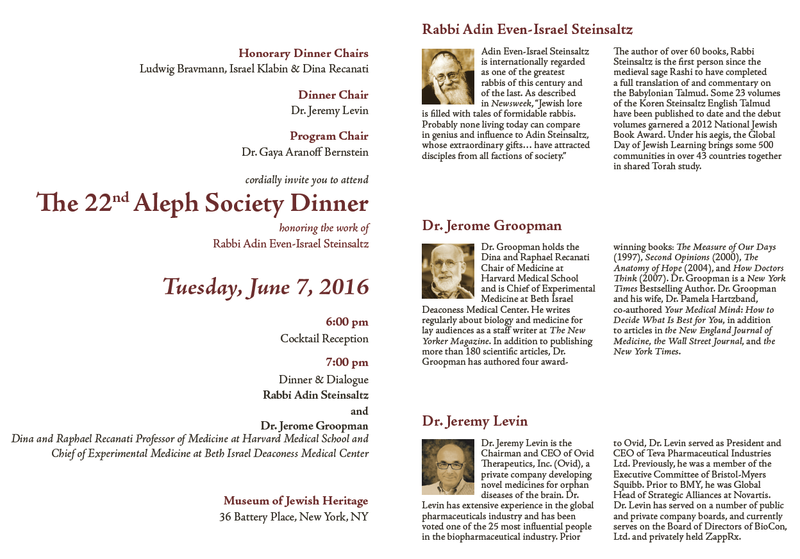 Seating for two ($1500) constitutes an Aleph Society Membership Contribution, and entitles you to a program listing. To make your purchase, enter $750 (or 750 x number of tickets) into the form below, and indicate in the Comments section the names of any guests you have purchased tickets for. but would like to contribute to the Aleph Society. We thank you for your generosity and continued friendship. Your contribution to the 2019 dinner supports the work and mission of Rabbi Steinsaltz.